The Hastings College Bell Choir came to Holyoke Thursday, November 2. Multiple Hastings students played in the choir. Holyoke students from both the elementary and high school watched the Hastings choir show off their talent through multiple songs. 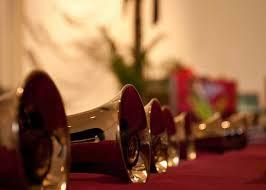 The college students used bells ranging from 7 ounces up to 30 pounds. Each of the bells made different pitches to add to the song. Besides the bell choir, five students performed a capella for us. A capella is making music using only the voice. All the college students in the singing group are self taught and were quite good. Overall, the performance was a lot of fun for everyone who was able to participate.